Skylights are a feature that can really brighten up your home. Letting in natural light is one of the best ways to connect your home to the outside. Like any window though, skylights are in need of cleaning and maintenance. 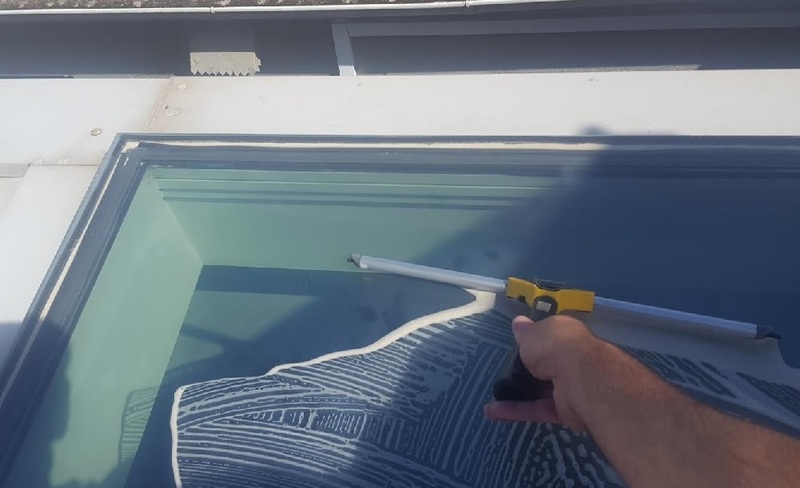 In addition to standard glass and window cleaning, we offer a skylight cleaning service in Sydney. Why is it important to get your skylights cleaned regularly? Skylights are normally positioned in a flat plane in line with the roof surface. This places them in a line of direct exposure to the sun, rain and any falling debris. Over time, the harsh weathering causes the glass to deteriorate if not regularly maintained. Bird poo, dirt and other debris left on the glass for long periods of time may cause staining in the glass that is hard to remove. Also, water staining and runoff from the roof or walls may similarly leave hard water of other marks behind. On the inside surface of the skylight, we often find mold spores. We find that many customers forget to clean the insides of their skylights. Mold spores can have adverse health effects. We recommend once or twice a year to get your roof windows or skylights cleaned. 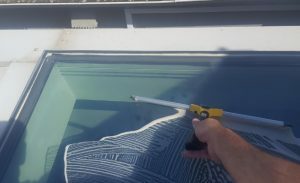 How do we clean your roof skylights? Skylights are usually made from toughened glass so they can cop a bit of a beating. Glass awnings or atriums likewise. 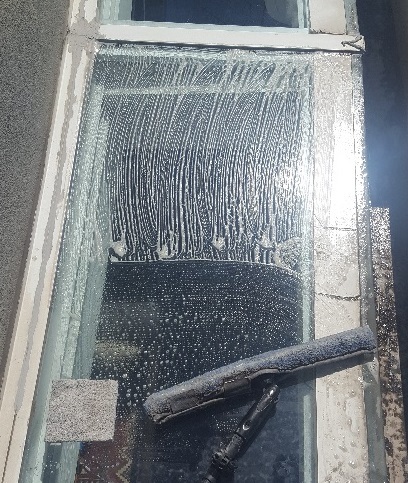 Still, we normally use regular window cleaning methods with a few twists. We use a coarse but scratch proof pads to scrub them down hard. 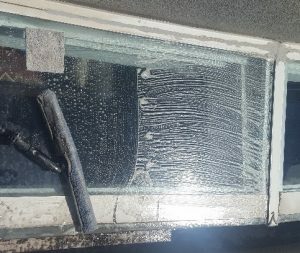 If this is not adequate, we can make an assessment and use a professional window cleaning blade that will safely shave of the debris or mineral residues from the surface. Our technicians may sometimes use chemicals to soften or dissolve the residues. We even have a couple of our own secret tricks that we use for a fine result. 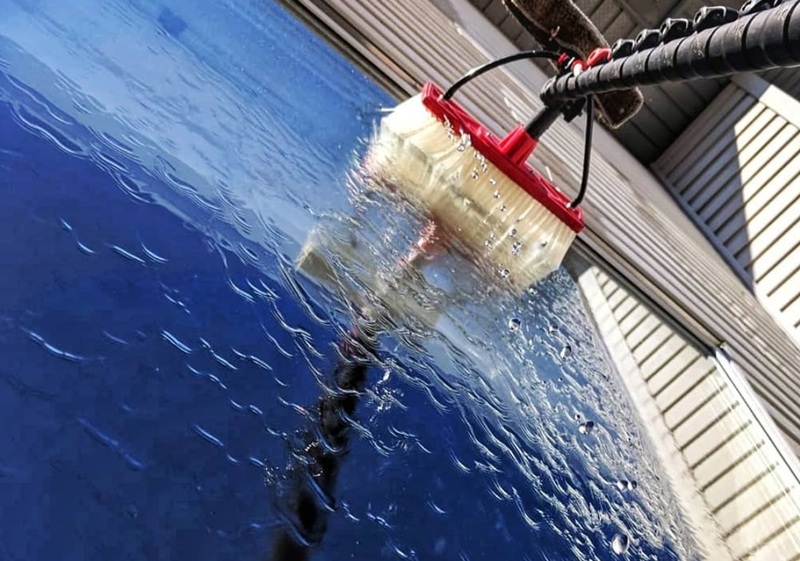 The glass cleaner will make sure to access your roof with safety in mind. They will take all the necessary precautions. What kinds of roof windows do we clean? Can we clean a badly stained skylight? Damaged? We offer a hard water staining removal service. This involves using a buffing machine and compound to remove surface layers of baked in dirt, minerals and hard water or calcium staining. Ninety-nine times out of a hundred, this is not necessary. If there are any cracks in your skylight we will let you know. With a smartphone, we can take a picture so that you can see for yourself. This is normally quite rare. Sometimes though the rubber seals can wear out so we can take a picture of these too if that is the case. Normally skylight cleaning is an add-on service to standard window cleaning at your property. If you specifically would like your skylights cleaned then please mention this to us. You can be sure that it will make a huge difference to the appearance of your property. Phone us for more information or to make a booking.